Lor mee is a hawker dish of Hokkien heritage. The lor or gravy is simmered for hours, with spices, meat stock, egg whites and corn starch to give it its sticky consistency; served with flat yellow noodles and some crunchy additions, it’s dish worth seeking out while you’re in Singapore. (You’ll also find lor duck, lor pork and lor beancurd at cheap stalls right across the city state). Lor mee tastes much better than it looks. Flat yellow noodles are a key ingredient, but then lor mee stalls will vary other ingredients added. Stewed pork belly, deep-fried fish in a crispy batter, fish cakes and deep-fried hand-made meat balls are among the ingredients most commonly found in lor mee — usually topped with a hard-boiled egg. Most stalls will also add chilli paste, sprigs of cilantro and a huge dollop of raw minced garlic for you to mix in with the broth to give it additional bite. You can opt out of these if you’re uncomfortable with them. For an added kick, lor mee stalls usually provide black rice vinegar, which you can add as liberally as you wish for a sour taste to cut through the rich broth — it definitely lightens the dish. If you wish for more spiciness, head for the chopped chillies and soya sauce that’s always available at Singapore hawker stalls. Hear that slurp? Chia Bee’s is a favourite of cabbies plying the night shift. Lor mee is not easily found, so many in Singapore do make a special pilgrimage to seek out the places serving the best. We’d suggest the following to try out the delicious dish; expect to pay from around S$3 for a bowl. 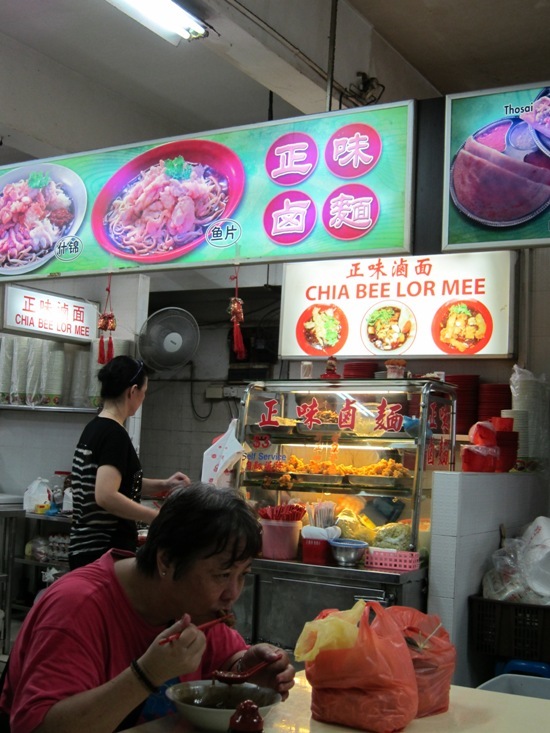 Chia Bee Lor Mee: Blk 10, North Bridge Road, Singapore. Open 00:00-10:00 (except Mondays, 00:00-8:00). Closed last Monday of each month. 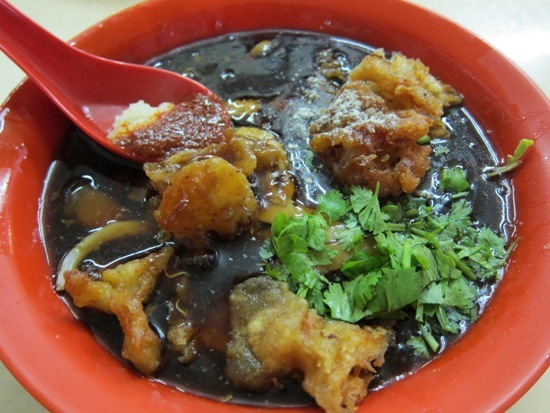 Bukit Purmei Lor Mee: Blk 109, Bukit Purmei Ave, #01-157. Open 07:30-15:30. Closed on Mondays. Read another review here. Yuan Chun Famous Lor Mee: 7 Maxwell Road, Amoy St Food Centre, #02-79/80. Open 08:30 till finished, usually some time in the afternoon. Closed Mondays and Tuesdays. Read another review of this spot here.